Ok, so yeah... I'm a computer consultant. That doesn't mean I've got a digital-only outlook on life. Sometimes the very best solutions are mechanical, and simple, simple, simple. And a lot of those are found on the farm. This is just beautiful... the dog's paws can't get a grip. And if he does manage to get a purchase, the bar will roll with his weight and the little beastie will slip back into his own yard. By the same token, if Rover is more of a digger, then railroad ties buried under the fence will put a stop to that, but that solution is a bit of a chore. In my dog's kennel, we stopped him from digging by placing some 12-inch pre-fab concrete paving pads just inside the fence perimeter. It took minutes to install and stopped the digging cold. I saw a lot of these in the Midlands of England... Oxfordshire and the surrounding area. 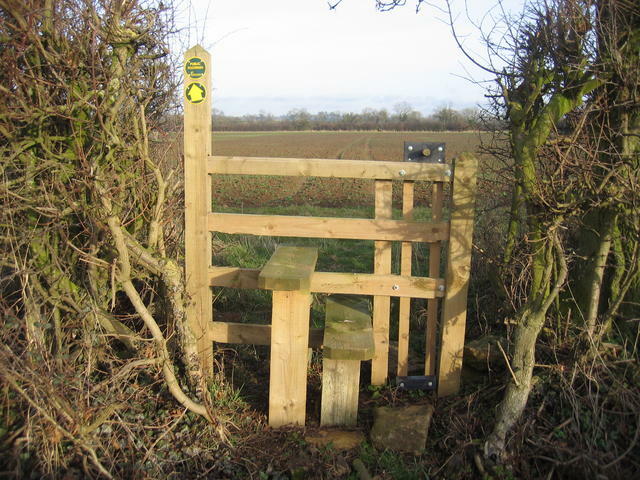 A superb example of a traditional kissing gate. The gate has no latch. It just swings freely between the two posts. A human or a dog can easily navigate between them, but the cattle find it impassable. The advantage over a regular gate is that it's easy to navigate while carrying a load; but most importantly it can never be accidentally left open, and the latch can never be learned by the animals. Sometimes the V-shaped portion is replaced by a rectangular or circular area to allow larger people, equipment, or the disabled in wheelchairs to pass. 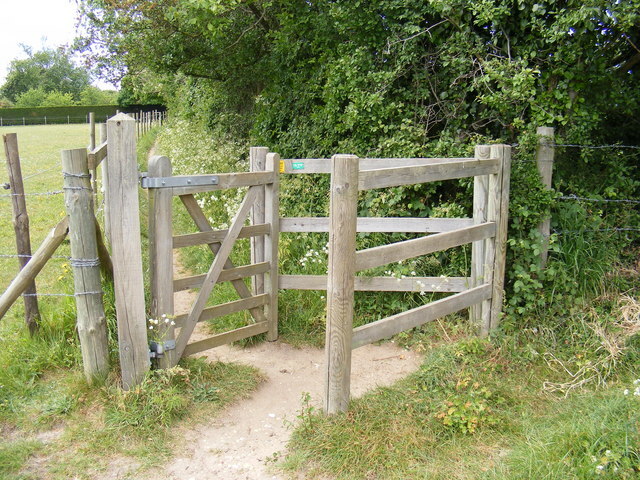 A variation of this one has no actual gate... just a fixed bit of fence extending between the two posts. Again, a man or dog can simply walk around the end of the fence, but a cow's long body can't navigate the twisty passage. We used a variation of this in a wooden cattle chute on my stepfather's farm. You face the tall post and use it to steady yourself as you step over the top rail. This one has a "dog gate" on the right side. You can lift it to let Rover through. My stepfather attended a one-room schoolhouse in Georgia. It had a fence surrounding it, and entry was through a stile. The purpose of the fence at that time was to keep the animals out. One of the reason you rarely see these things in the US any more is that America is so very big. Also, so very thinly populated.As a result, we have an automotive society, and we've developed a concept of private property that generally keeps us off other other people's land. Seriously, most of my neighbors in the UK had no real conception of the astonishing spread of the US landscape. On the other hand, villages in England are very compact by our standards, and actually quite close together. Public walking paths between villages and towns are not only common, they're protected by common law and statute. There is a presumption of access to the entire countryside, so long as no damage is done to crops or livestock. 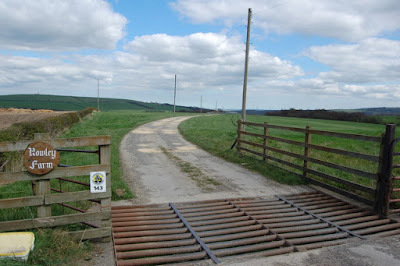 All of the images above from Geograph.org.uk are of barriers on public walking paths. For a comprehensive map of them, you might want to visit http://footpathmaps.com. You can see the extensive network of public footpaths near my former home by searching for Caversfield and selecting either location (they're side-by-side). In the US these are called cattle guards. While they're ubiquitous in the West, you can go your whole life East of the Mississippi without seeing one. The first one I ever saw was on the walk up to Uffington White Horse from the car park. It's nothing more than a ditch covered with a series of parallel bars. The bars are often round tubes so that a cow's hoof will slide off of it. Cattle grids don't always work well. Sheep and goats, for instance, are pretty agile, and can simply walk across. But it's a neat idea, and it does the job well for cows. I've heard some folks complain that they must be cruel because a cow could break its ankle between the bars. In practice, the cows aren't that stupid. The device works because the cattle quite reasonably don't want to get their legs caught in the gaps. It's not like they get caught blindly walking across. Rather, they choose not to try. However, vehicles drive over the grids easily, and humans easily step across on the bars. One interesting fun fact: you don't always need the bars. Apparently you can sometimes get by with just painting bars on the ground. OK, so maybe the cows are that stupid. There's a never-ending arms race going on between birdfeeder enthusiasts and squirrels. That's right, just plain old grey squirrels. For some reason, people love to feed birds, but couldn't care less if the neighborhood squirrels starved to death. The "problem" consists of keeping the squirrels out of the bird feeders. 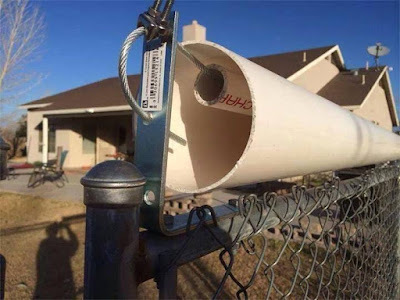 People have tried an amazing variety of defenses against voracious squirrels, and the squirrels easily outwit a surprising number of these clever devices. A working solution requires you to do a number of things: 1. put the bird feeder on a post that's at least 10 feet away from any tree or structure. 2. install a baffle of some sort on the post. Both are necessary, as squirrels are jumpers par excellance. This YouTube video illustrates what happens if you do one, but not the other. just go forward to the 5:45 mark to see the little guy win. See the problem? Yeah, the nearby urns are "structures", and provided the squirrel with the advantage he needed. But given the restriction of "no nearby structures", the baffles actually do work. You could spend a lot for one, but a very good working solution is to simply make one out of a length of furnace pipe from your local hardware store. I was going to give instructions, but as is often the case, I've found some already posted that are almost ideal. Here's a link to Today's Homeowner. The only improvement I'd offer to what they've got there is that this works best if you do NOT attach it solidly to the post. In fairness, they don't, but the hose clamp they use can get wedged into your endcap after a few lucky hits. A few small L-brackets may do the trick better. Attach them to the pole, but just rest the encap on them. The vertical portion of the bracket should be lower than the horizontal portion, so the endcap easily moves. Also make the hole in the endcap just large enough to accommodate this. That way, the whole baffle tilts when a squirrel jumps onto it, and he loses purchase and falls off. Any attempt to climb the post only puts him inside the stovepipe. The pipe itself can be painted and decorated, so long as you don't use any decoration that would give the squirrel a climbing advantage. My stepfather had another deterrent in addition to a baffle: he put the bird feeder on a... "teeter", he called it. If the squirrel jumped from a nearby tree, the feeder would swing away and the squirrel would fall off. Unfortunately, so would a lot of birdseed. Pretty soon the squirrels found out they could get whatever they wanted with an airborne kick at the feeder, followed by a smorgasbord on the ground. My own solution is a lot easier, I think. I just put up a squirrel feeder. It's just a bit of board with a long drywall screw exposed vertically. You screw on an ear of corn, and put it in a spot that's easily accessible to the squirrels. With an easy meal at hand they're more inclined to leave the bird feeder alone. Sometimes it's just easier to understand what's motivating the animal. There's one animal that defies all barriers, though. When I was a kid we had a raccoon that would raid our trash cans. Keep in mind that this was in the 70s when the galvanized trash can was the standard. We put a brick on the top of the can, hoping to dissuade the raccoons. That only gave him better leverage to turn the can over. We tied the can to the fence to prevent it from being turned over. He pushed the brick off. We tied the top to the handles on the side. He untied the cord. We used a better knot. He gnawed through it. We set up booby traps, tying pull-string fireworks to the can hoping to scare him away. After the first night, he untied the fireworks. We got a latching trash can. He learned to unlatch it. We got a dog. The raccoon made a new friend. But he stopped raiding the trash. Why? I assume it's because the dog food was easier to get. I think, sometimes, it is just cheaper to pay the protection racket.